Houses and heavy items are individually priced. 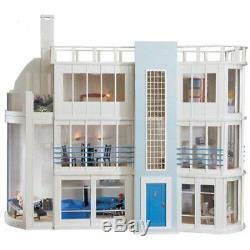 Malibu Beach Modern Art Deco Dolls House Unpainted Flat Pack Kit 1:12 Scale. 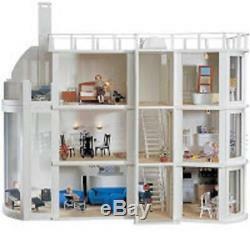 1:12 Scale - MDF - Flat packed and unpainted ready for you to decorate in the style you choose. Pictures are for display to show what could be done with this kit. This Art Deco building makes a wonderful home, but could easily be adapted to become an art gallery, department store yes - several stacked on top of one another! Or a Miami Beach Hotel! The addition of the roof-top sun lounge means you can have your very own spa with Jacuzzi - what bliss. Move this house from West-Coast to East-Coast and back but remember to add some lighting to bring the sunshine inside. The cosmopolitan Malibu Beach House has had a starring role in Mark Ronson's album advertisement and is now a celebrity in her own right! This modern house has circled the globe several times over to spread that Malibu sunshine to dolls' house collectors all over the world! Decorate with contemporary furniture or art deco. Six spacious rooms on three floors. Top floor suite comprising: master bedroom, bathroom, dressing area and balcony. Ten opening panels, which slide out to give excellent access. Integral fire place in living room. Curved'glass' roof over the stairs. Malibu Beach House measures 96.3cm Depth 48.1cm Height 86.6cm = 38 x 19 x 34 inches. SKU: DE0909 / Barcode: 8800159370878. Brand: Melody Jane Dolls Houses. PLEASE NOTE: All of our items are miniatures for doll's houses and miniature scenes, they are NOT life size items. We cannot be held responsible for any misunderstanding of this fact. Over 4,500 Stocked Items With items added every day, you're bound to find what you need! We've got you covered! The item "Malibu Beach Modern Art Deco Dolls House Unpainted Flat Pack Kit 112 Scale" is in sale since Tuesday, March 27, 2018. This item is in the category "Dolls & Bears\Dollhouse Miniatures\Doll Houses".